Facebook is great for maintaining relationships of all kinds, but letting them overlap can be a recipe for disaster. Fortunately, it has started to roll out its much-anticipated update to its privacy settings to let users determine on a post-by-post basis exactly who they're sharing with. Here's how you can use the new functions to avoid a Facebook meltdown without spending all day micromanaging your privacy preferences. You'll know you have access to the new privacy settings if you log on and get a dialog box titled "Important message from Facebook." Clicking Continue To Next Step will take you to the site's transition tool, which will allow you to import your old privacy settings. Facebook has its own explanation video for the transition tool, but the gist of it is that your old profile privacy settings--whether such parts of your profile as About Me, Work and Education, and Religious and Political Views are visible to Everyone, to Friends only, or to Friends of Friends, for example--can be imported or changed here. Facebook's old system organized people into regional networks like "San Francisco" or "Japan," but the new version has removed this so that you won't be able to restrict information to just people in your area any more. Also, the "Everyone" setting doesn't just mean all of Facebook--it means the whole Internet, including Google and other search engines and Facebook-enhanced apps. If you never made any changes to your privacy settings, then Facebook will suggest its default settings. These defaults set your contact info to a Friends-only list; your photos, videos, birthday, and religious/political views to Friends of Friends; and the rest of your profile data to Everyone. The most important setting in the transition tool is the Posts I Create setting, which sets your default privacy settings on the content you share via Notes, Wall Posts, Shared Links, and so on. Setting this to something more conservative than Everyone will save you the effort of having to manually adjust it on each of your Facebook posts. Most of the profile privacy setting changes aren't too dramatic from their old functionality, so many of our tips from the article "Protect Your Privacy on Facebook and Twitter" are still valid. 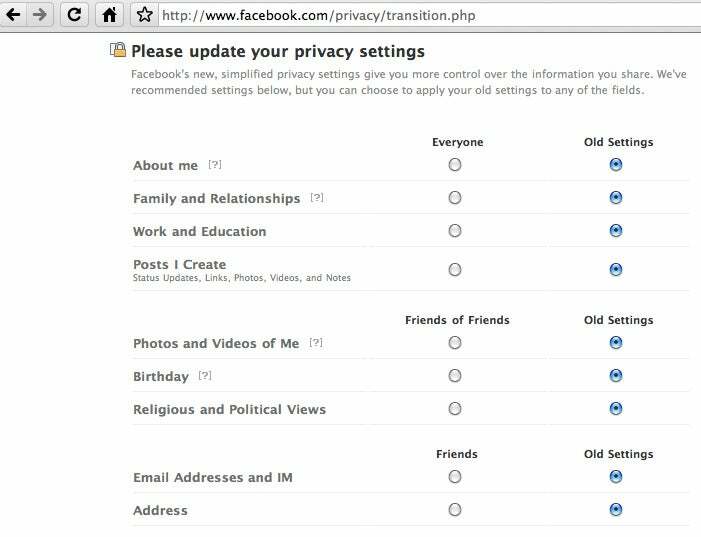 The main privacy changes are centered around your Facebook feed. Unlike your profile information, your Facebook feed (all the status updates, pictures, videos, links, and blog posts you and your friends exchange over Facebook) is absolutely loaded with potentially embarrassing or compromising material that you won't want to share with your whole Friends list, much less the entire Internet. The new feed privacy controls. When you type anything or paste a link into the open box at the top of your Facebook feed or a friend's profile, a small lock icon shows up next to the Share button. Click this and you'll see a menu that lets you define the people you want to show and hide the post from. You can choose to show to Everyone (which will bring up a warning dialog box before it lets you post), your Friends, a particular group of friends, or the networks (typically school- or employer-based) to whichyou belong. 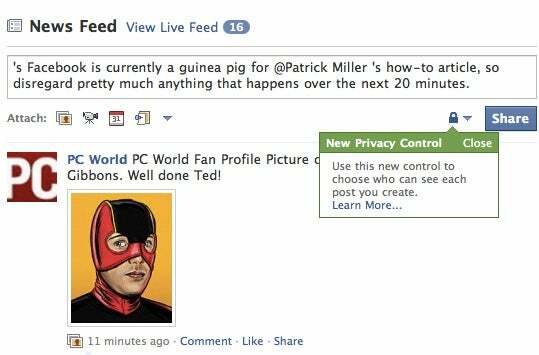 Once you set your privacy settings and post your content to the feed, it will be visible to everyone who's allowed to see it. You cannot change the privacy settings for any item in your feed after you post it, including photos and videos, unless you delete and repost. Events and Groups are not affected by these settings, so the We Hate Patrick Miller Club will have to stick to the older privacy controls to stop me from showing up at their club meetings. You can also specify your privacy preferences for all your Wall content by going to your profile, clicking the Options button under the Share button, and clicking the new Settings menu that pops up. This lets you toggle who can post on your wall as well as who can see those posts, preventing your friends from saying things you don't want your boss to hear (or vice versa). As of this writing, Facebook Lite doesn't have the new Feed-based privacy features and will just use your default settings.